Our values reflect our culture. 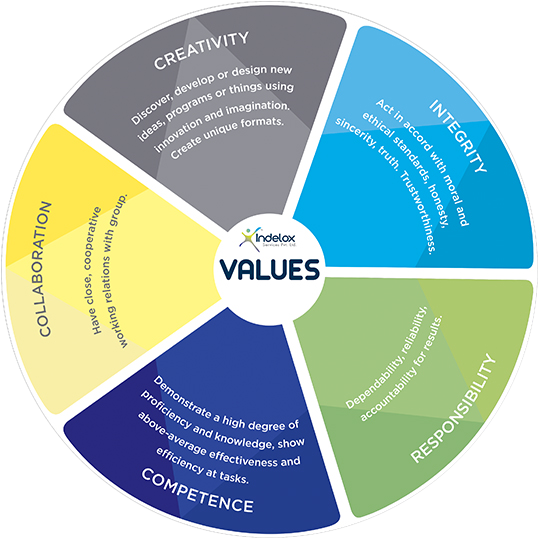 Our values at Indelox are Integrity, Responsibility, Competence, Collaboration & Creativity. What we say, that we do. We converse and handle issues ethically. We exhibit trust and ethical values in doing right things. We always stand by as a role model to others. We keep our people updated about what’s going on in the business. We make our staff understand the role they play within the team, in the company and in delivering strategy and plans. We make our people understand how their work fits into the bigger picture and what the team/company as a whole is trying to achieve. We always work closely with our staff to be more productive & motivated. We assist everyone in acquiring new skills and knowledge. We insist that each member is geared to offer something unique with their abilities. We encourage people to get ahead by developing a winning attitude. Our people are trained to win other’s confidence by demonstrating competence. We work as a team to achieve mutual goals. We work with all individuals, who have different abilities and skill sets. We encourage our staff in their tasks in all situations. We always appreciate and value our team members. We build the sense of ownership that will enhance their connection to the work and to the organisation. We encourage our people to come up with ideas – ideas that help improve or make things better. We respect people and their ability to observe things and find new ways to do tasks better. We empower people to evolve their own working style, and enrich the organisation with its versatile thinking. We allow the team to build strong working relationships and trust across the organisation.